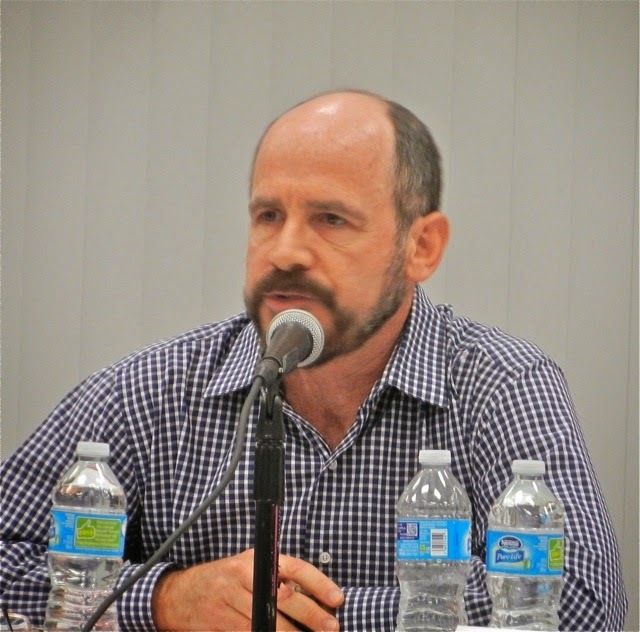 The Costa Mesa City Council will hold its first meeting of April on Tuesday, the 7th in City Council Chambers at City Hall in what could be a shorter than normal meeting. That means we will likely leave sometime Tuesday night instead of Wednesday morning. Seriously, it won't surprise me if this meeting - which is scheduled to begin at 5:45 p.m. ends before 9 p.m., but you never know with this group. You can read the agenda HERE. The open session will be preceded by a closed session at 5:00 p.m. in which several law suits in which the City is a party will be discussed by the council. We never know what kind of turnout we will have for the Public Comments segment of the meetings - that time when members of the public can talk on items NOT on the agenda. Things like the debacle of the Fairview Park Citizens Advisory Committee meeting, or the Roland Barrera fiasco, etc. The Consent Calendar has ten (10) items listed. These are, theoretically, "routine" items that could be passed with one vote unless a member of the public, a staff member of a council member pulls one for separate discussion and vote. If that happens, those items will be trailed to the very end of the meeting, a stupid decision implemented by the council to discourage debate on issues. Item #3 on the Consent Calendar is Warrant #2533, HERE. Some of the more interesting items - to me, anyhow - are listed for your reading pleasure. West Coast Arborists, Inc. - $56,516.00 - Tree Planting and Maint. LSA Associates, Inc. - $7,523.30 - Initial Studies, Mitigated Dec.
Once again, we spent more than $180,000 on legal fees and a load on temporary services. 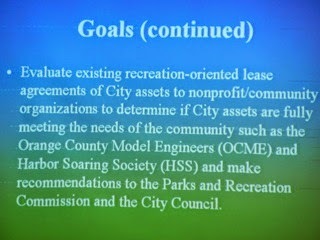 Item #6, HERE, is the 2014 Annual Review of the Costa Mesa General Plan and it's going to be done as part of the Consent Calendar, without discussion? Really? Item #7, HERE, is a budget adjustment request to continue funding the use of law firm Meyers, Nave, Riback, Silver and Wilson on Fairview Park issues. It means an additional $38,190, that would come out of CEO Tom Hatch's slush fund, er, contingency fund. Interesting that we're doing this one as part of the Consent Calendar, too. Item #8, a request to amend Council Policy 100-8, Conference, Meeting and Training Expenditures, HERE, is to permit travel to Las Vegas without full council approval. The way the change is worded, officials could travel to Salt Lake City, Utah or Santa Fe, New Mexico without full council approval. Item #9, HERE, is the approval - again - for Mayor Steve Mensinger and Mayor Pro Tem Jim Righeimer and several senior staffers, including CEO Tom Hatch and Development Services Director Gary Armstrong, to attend the annual RECon - The Global Retail Real Estate Convention, International Conference of Shopping Centers (ICSC) in Las Vegas, May 17-20, along with city staff AND approve canceling the May 19, 2015 City Council meeting! No mention is made in the staff report of any positive results in the form of new businesses attracted to our city as a result of attending this conference in prior years. Unless sending representatives to this conference produces tangible results in the form of new businesses attracted to the city, this seems like a waste of time and likely ends up just being a big schmooze session for Righeimer and Mensinger to chat up their developer pals at city expense. An interesting line in the staff report may be found on page 2, under "key goals". It reads as follows: "4. 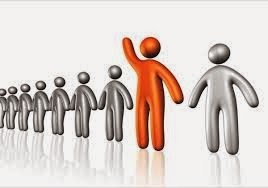 To schedule meetings with prospective businesses to present our City's Welcome Message," and to provide a "stream-lined" process for accommodating new business;" I found myself thinking about Roland Barrera and the "streamlining" he's experienced recently - opening two new businesses, one without any permit of any kind, and violating city rules in both. Yep, that's "streamlining", alright! And why cancel the council meeting? We would still have a quorum with Gary Monahan, Katrina Foley and Sandra Genis present. The City's business COULD be done. 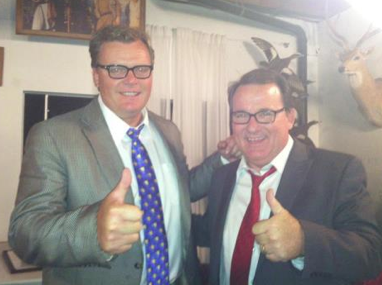 Heck, maybe we could get the new CMPOA contract approved that night! 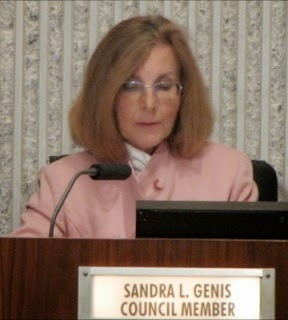 Item #10, HERE, is the designation of Sandra Genis as Costa Mesa's voting delegate for the Southern California Association of Governments (SCAG) 2015 Regional Conference and General Assembly. 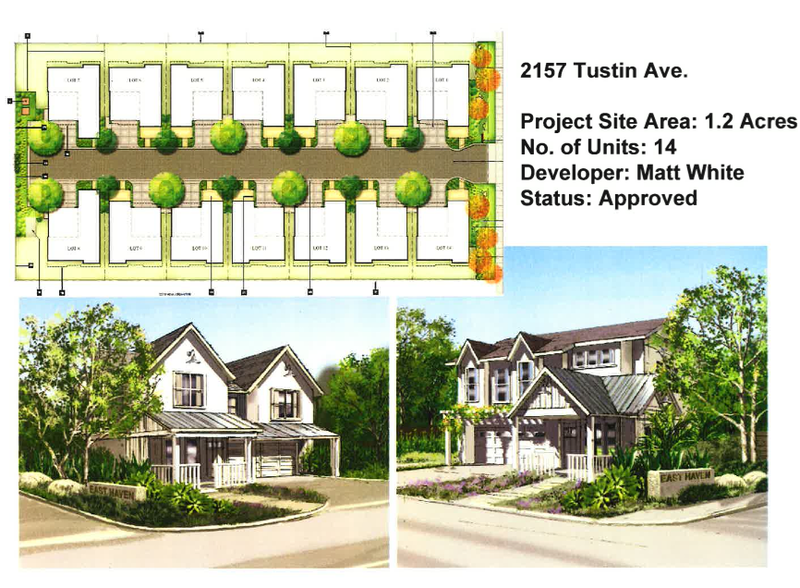 There are no Public Hearings scheduled, so we will go directly to Old Business #1, HERE, the second reading of the Small Lot Ordinance amendment that makes it even EASIER for developers to jam more dwellings onto small lots. The final item on the agenda is the biggie, New Business #1, HERE - the appointment of individuals to 61 positions on the Senior Commission or one of seven (7) committees. Take a look at the staff report to see the names of your friends and neighbors who have volunteered to spend precious personal time to support worthy issues in the City. Personally, I'll be interested to see if the cronyism we've seen in the recent past with this council is perpetuated in this round of appointments. If no items had been pulled from the Consent Calendar, and if all the folks wishing to speak under Public Comments had done so earlier, that would mark the end of the meeting. I'm hoping for 9 p.m., but one never knows... See you there. Arriving a little early at the Victoria Room of the Neighborhood Community Center last night for the most recent - and maybe final - meeting of the Fairview Park Citizens Advisory Committee I was surprised by the optimistic number of chairs arranged for the event. You can take the time to count them from this panorama shot, but my best guess was that just over 100 seats were available for attendees. Fewer than half that many were actually used. Vice Chairman, now identified as "Acting Chair", Steve Smith kicked the meeting off following the roll call which saw member Anna Vrska absent due to travel complications - she's stuck in Munich - with a glib statement that "the rest of us are here because we didn't have a good excuse." Nobody in the "crowd" of fewer than 20 people at the time laughed, which kind of marked the way the meeting would proceed. 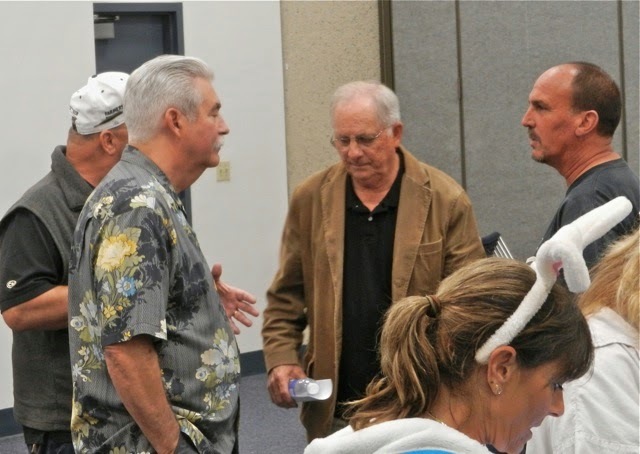 The remaining other six members of the committee were present: Smith, Ron Amburgey, Terry Cummings, Dennis Popp, Lee Ramos and Frank Davern. Council Liaison, Mayor Pro Tem Jim Righeimer, was absent and his alternate, Sandra Genis, showed up well into the program. A footnote: former Chairman Dr. Richard Mehren attended the meeting and sat quietly observing the proceedings near the front of the room. Smith then addressed the issue of possibly electing a new Chairman, citing the fact that this may be their last meeting for at least a year. Nobody nominated anyone else, so Smith proceeded to conduct the meeting. Mejia would just present the staff report and that would be that. 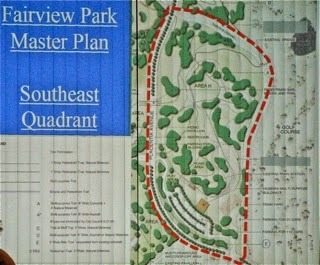 He began with an overview of the Southeast Quadrant of the Park - the final remaining chunk of land to be considered. He then spoke briefly of the Constraints that were faced when considering placing fields of any kind in this quadrant. He spoke of the biological resources thought to be part of this section of the park, including the burrowing owl and other species. 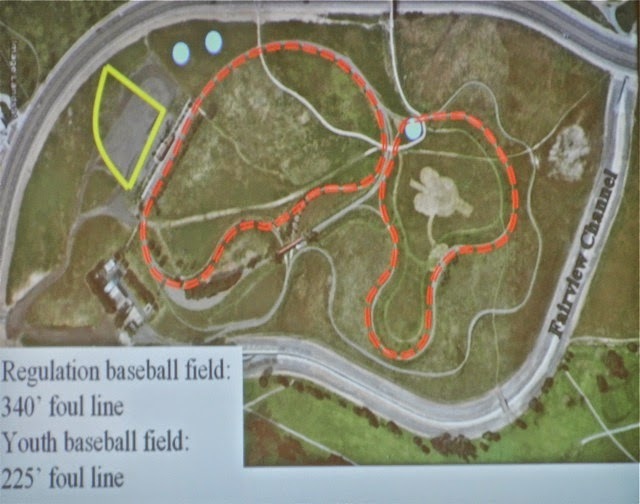 He then went through several slides showing possible sites for playing fields within the existing infrastructure - mainly the Orange County Model Engineers tracks and buildings. He then went through the scenario if the entire Southeast Quadrant was to be graded to overcome some of the topographical constraints that currently exist, and the Model Engineers infrastructure was to be relocated. 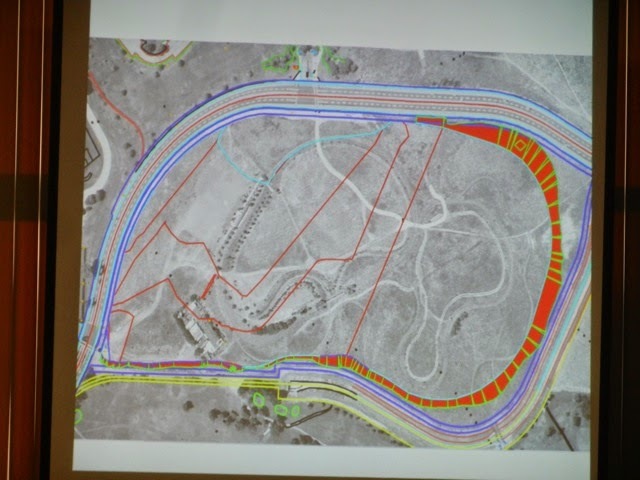 The result was the following configuration, which he stated would be the best use of the land IF fields were to be considered AND if funding could be found to do it. 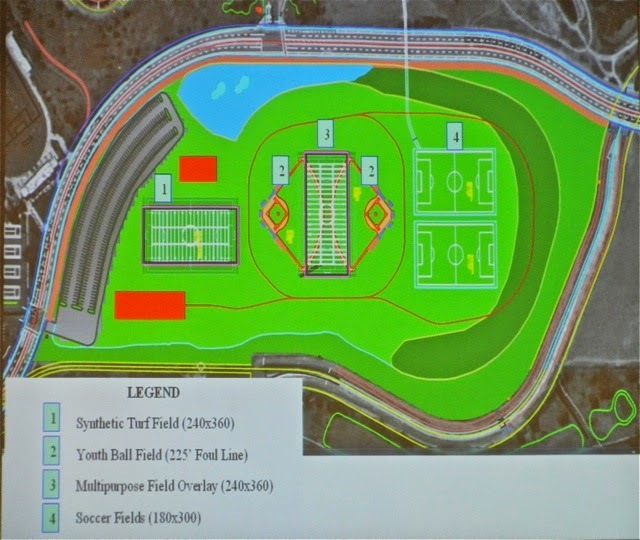 As you can see, this configuration provides parking along Placentia, relocated the Model Engineers facility slightly, and includes (1) a synthetic turf field, (2) two youth ball fields), (3) a multipurpose field overlaying the ball fields and (4) two soccer fields. 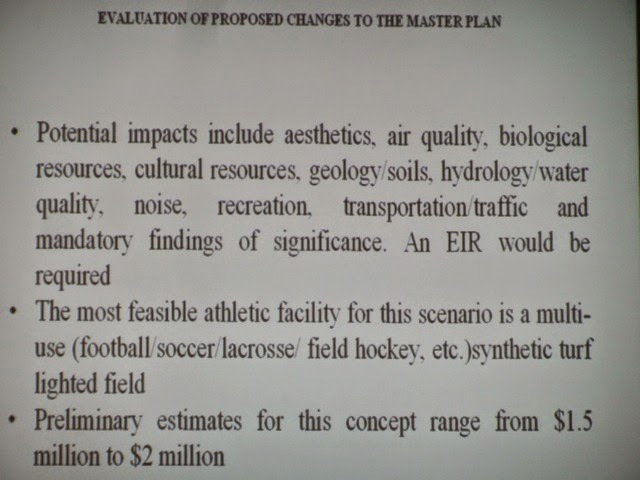 The impacts to the Master Plan are shown below. And that was that! Following the short - ten (10) minute - presentation by Mejia, Chairman Smith said, "And that fulfills the requirement assigned to us by the council." He told us the PowerPoint presentation would be available online shortly and we moved on without comment from any of the members. It was bizarre, since this analysis took many, many hours of staff time to prepare and has the potential to make the greatest impact on the park, yet none of the members were permitted to make any kind of observations. I found myself thinking about just how frustrating this must be for the staff, which has toiled for nearly two years on this project. Smith then opened up the meeting for Public Comments, limiting each speaker to two (2) minutes each. From my vantage point I got photos mostly of backs of heads, so I'll just try to give you a short summary of what most speakers said. Let me say right up front that 20 speakers - about half the number in the room - addressed the committee in two segments because Smith botched up the first segment. Of those speakers, only two were in support of playing fields anywhere in the park. Mary Spadoni led off with a quote from member Ramos from a Feet To The Fire Forum last fall in which he said he wanted to keep the park as it is, and accusing him of lying to the public in a campaign because he voted to proceed with the analysis of playing fields on the Southeast Quadrant. Jay Humphrey briefly thanked the committee and staff for all the work they'd done and said he was looking forward to the committee reconvening in 2016. 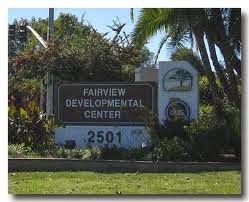 He encouraged them to continue to be involved with the consultant hired for the update of the Master Plan, and to look into the acquisition of the Fairview Developmental Center property. 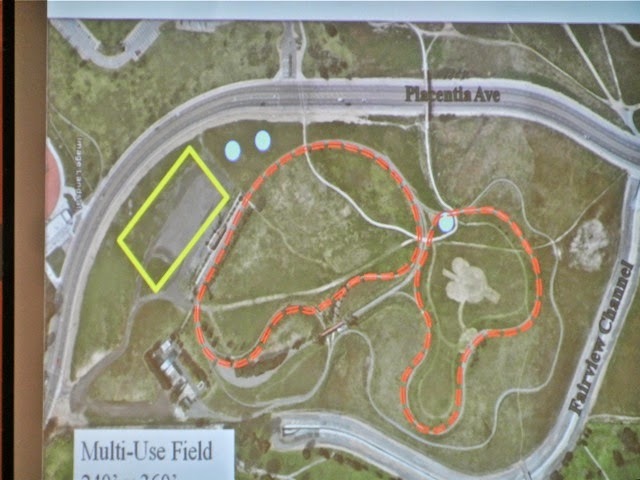 Gary Stickle, a professor from UCLA, spoke of the protected species and the Native American artifacts, calling Fairview Park our "Stonehenge". 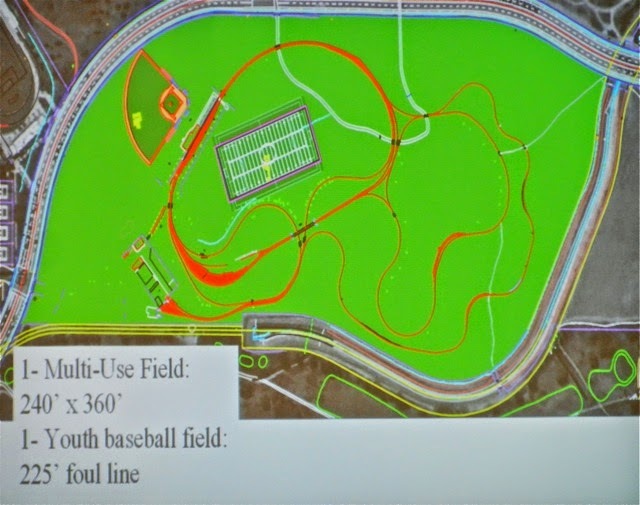 Patricia Martz - a frequent speaker at these meetings - observed that "capping" of the area to make fields was inappropriate because they are sacred burial grounds and kids shouldn't be playing on burial grounds. 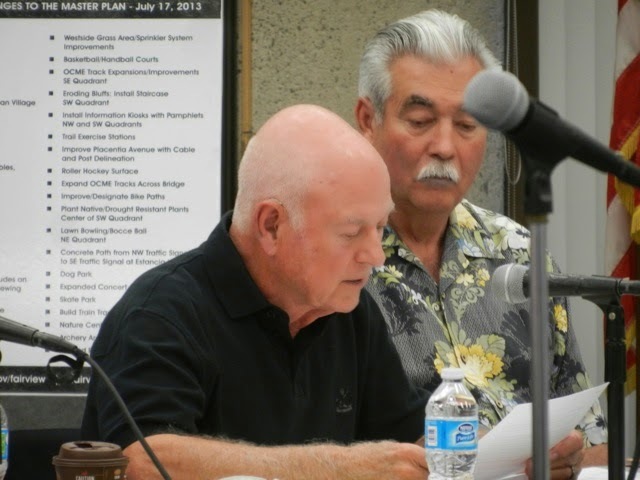 Terry Koken stepped up and chided Popp about his birthday, then stated that Fairview Park should be left the way it is. Lynn Redmond spoke about the project his son, Christian, was completing in the park - replanting native plants, and thanked those who supported the project by helping and contributing. Beth Refakes thanked the committee for their efforts, but suggested that we had the cart before the horse because we had not done a needs assessment first. She suggested that if the decision was made to move forward with playing fields, particularly in light of the probable costs, then the issue should be placed before the voters. Cindy Brenneman also stepped up and said the park should be kept natural. Ann Parker chided Ramos for lying to the people and suggested that he was just a plant by Mayor Mensinger and Righeimer on the committee to sway it toward playing fields. Gay Royer spoke of her personal experience with development on Native American locations. 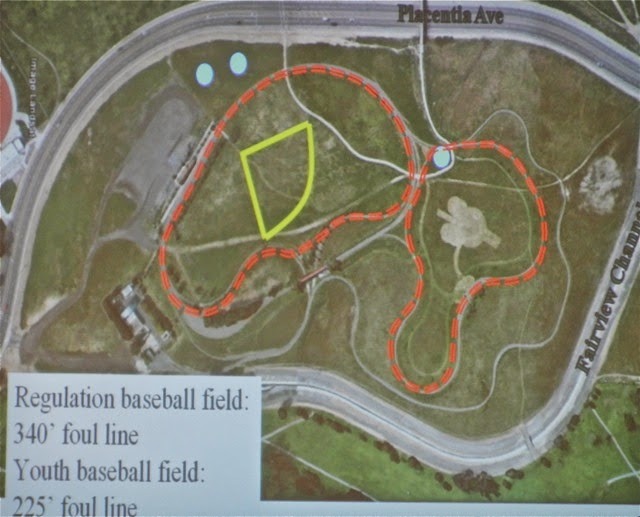 Kim Hendricks said no data had been presented that showed a shortage of playing fields and said the committee failed to listen to the public. Lou Desandro identified himself as "the other side" - one of those in support of playing fields in the park. 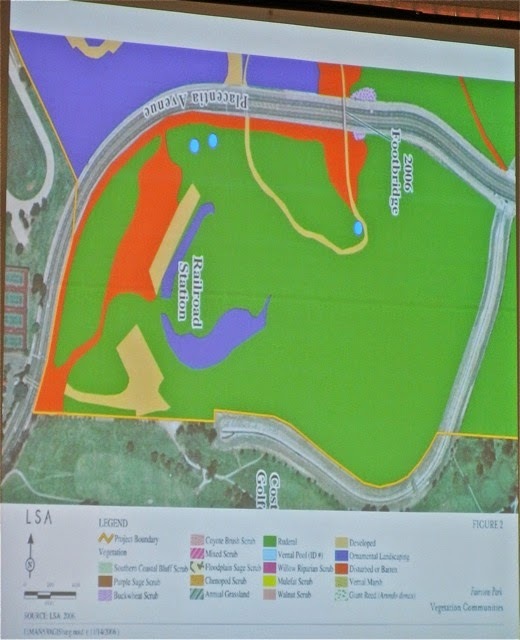 He said those speaking didn't represent the majority of residents, then suggested that the Southeast Quadrant be converted to playing fields, "because the rest of the park is natural". Steve James, a professor from Cal State Fullerton, suggested that the Native American sites are too precious to be defiled, and that the park should remain natural. 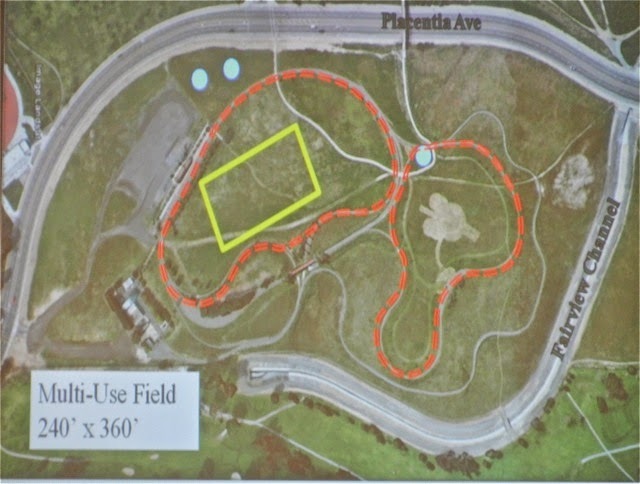 Cindy Black identified the committee as "tools" - of the council and suggested that Ramos and Davern didn't know anything about the park when appointed. She suggested that big campaign contributors - "Argyros, Segerstrom and Buck Johns" - should provide some cash to identify other sites for playing fields. Margaret Mooney also cited Ramos campaign comments and noted how quickly folks were supporting lighting, but said it should be done at other venues, not Fairview Park. Robin Leffler thanked the committee for their work, then observed the lack of a needs analysis and suggested that the committee should remember they are to serve all the people. That took us to 7:00 p.m.
A half hour later, just as the meeting was about to close, Smith was forced to permit four other speakers to exercise their time because of his screw-up. When originally challenged about it his response was, "It's not my problem!" Not very "leaderly", to say the least. Anyhow, a pair of soccer moms stepped up with their two little girls in tow and pleaded for the park to remain natural. The children spoke, too. 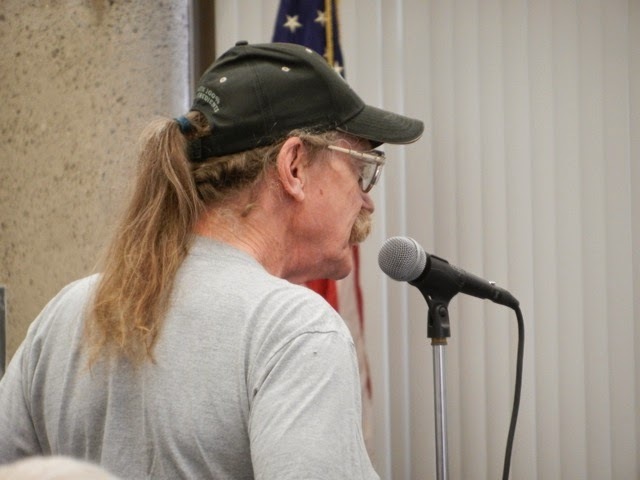 John Rubright - an AYSO supporter and the only other "pro-fields" speaker - stepped up and chided those who wanted to keep Fairview Park natural. He chided the OCME site, stating that it "was not natural". Rubright has spoken before to the committee and each time he doesn't serve his side well because he doesn't present a compelling argument for more fields. Cindy Black stepped up (again) because Smith had screwed up earlier on the final agenda item and refused to let the public speak to it. She said 'No" to the trail. 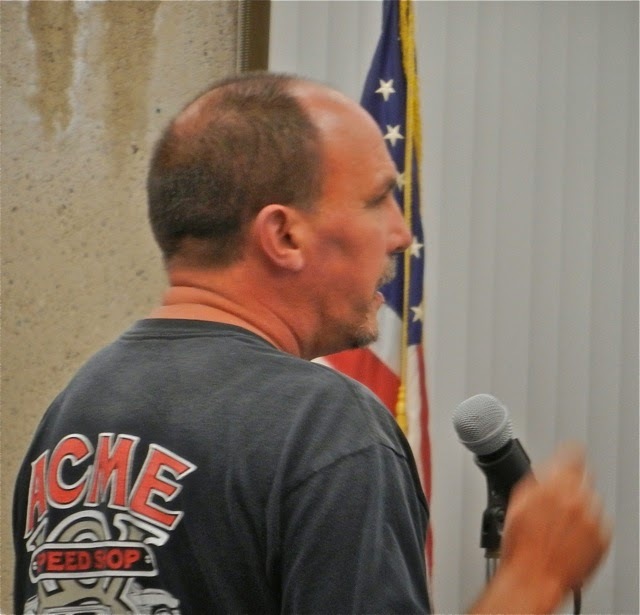 The final public commentor was self-described Soccer Dad and AYSO referee, Kevin Shannon, who strongly recommended that Fairview Park be kept natural. Back to 7:00 p.m. 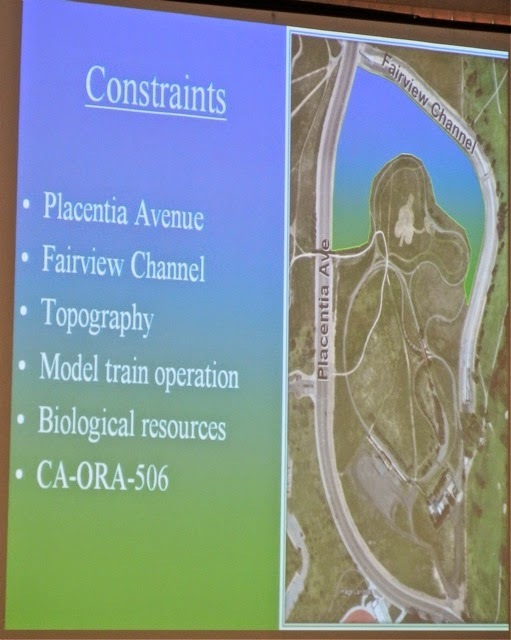 The final item on the agenda was the consideration of a possible East Fairview Channel Trail. No member indicated an interest in discussing it and Smith failed to permit public comments on it but the committee voted, 5-1, to have the staff prepare a study! They won't hear about this for a year. This was a major boneheaded move on many levels and showed a tremendous lack of leadership on Smith's part. Interesting, since he has been openly critical of former Chairman Mehren's leadership but did virtually nothing to help him for the past nearly two years! 1 - The FDC property would be free of environmental or cultural complications. 2 - It would be a great project for new State Senator John Moorlach to champion. 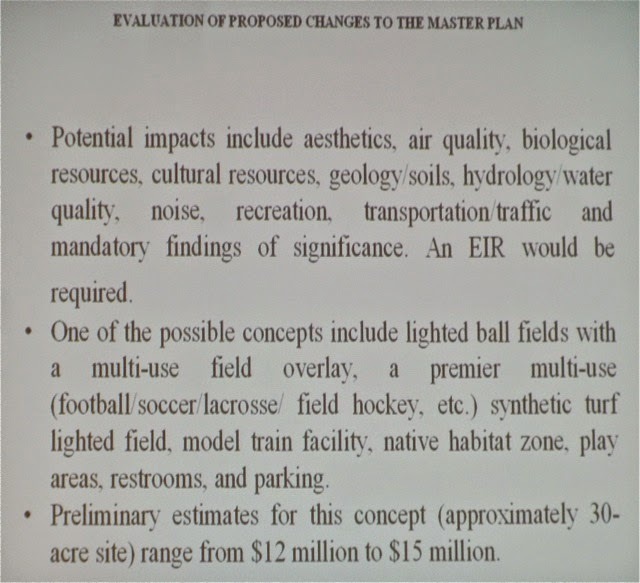 3 - Sports Fields should be made a priority for the property and the consultant dollars for the Master Plan should be diverted to investigating the acquisition of the FDC property. 4 - Leave the existing Master Plan in force and adjourn to 4/1/2020. Ron Amburgey had nothing to say. Dennis Popp expressed disappointment in the personal attacks. Ramos said he was suprised that it became "Lee Ramos Fan Night", referring to several critics. He said he does believe in passive parks and criticized member "Varska" - he meant Anna Vrska, but added a vowel to her name - for taking up staff time demanding statistics. He defended his knowledge of the park by stating he walks it three days a week. Davern, who replaced deceased David Stiller midstream, responded to criticism by Cindy Black, indicating he DOES know about Fairview Park, having hiked "280 miles" there. He said, to her, "I've yet to see you there." He said he formed his opinion about the need for more fields by talking with the people he encountered in the park - "mostly Latinos" - who said they need playing fields. He said 99% of the residents don't attend these meetings. Well, duh! Smith then said, "The real losers in this year-long delay are the kids of the community." He cited the need to continue moving forward, particularly with the school district, to find more fields. He thanked the City staff for their hard work. At that point, as he was about to adjourn, we had the followup Public Comments. Then, at about 7:30, the Fairview Park Citizens Advisory Committee folded up its tent and departed. 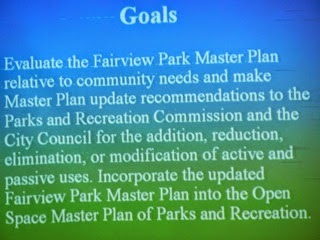 Nobody knows when - or even if - this group will meet again to discuss the future of Fairview Park. And, since the committee has NOT been disbanded, the members are still governed by the Brown Act, so if, for example, Ramos, Popp, Amburgey and Davern gather and discuss this issue they will be violating the Brown Act. The City Council should disband this committee to remove that burden for the unknown period of time into the future and, if necessary, re-constitute it in the future. A couple observations. 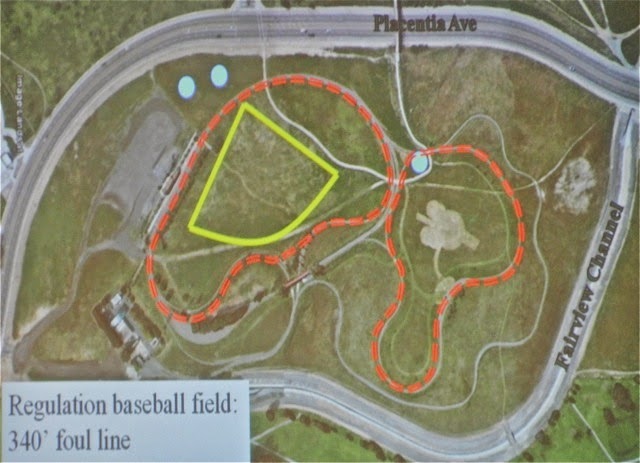 This committee was hastily-created by a council majority intent on finding a way to develop playing fields in Fairview Park, and stacked the membership toward that end. I doubt if they, the council, actually thought it would take nearly two years to reach this point, and then to basically have nothing they were looking for to show for all the time and effort. This effort - which was premature at best, because there was no data presented at ANY TIME to demonstrate the need for more playing fields anywhere, much less in Fairview Park - should not have been launched in the first place. The update of the Master Plan of Parks and Open Spaces was pending and this effort should have been subordinated to that process. I've attended almost all of the meetings of this committee and among the things that have been consistent is the ratio of members of the public who spoke out against playing fields versus those who stepped up to ask for them. The numbers were overwhelming from the very beginning. One would think - with the organizational skills of the youth sports groups - that they would have eventually rallied THEIR troops to present THEIR side of the issue to the committee. That effort was feeble to the point of being almost non-existent. Where the heck were they? I'm NOT saying we don't need more places for kids to practice organized sports, and actually to just "play". In recent months the pro-fields groups have uniformly acknowledged that the shortage is in "lighted" fields for kids to practice - not "game day" fields on which to compete. 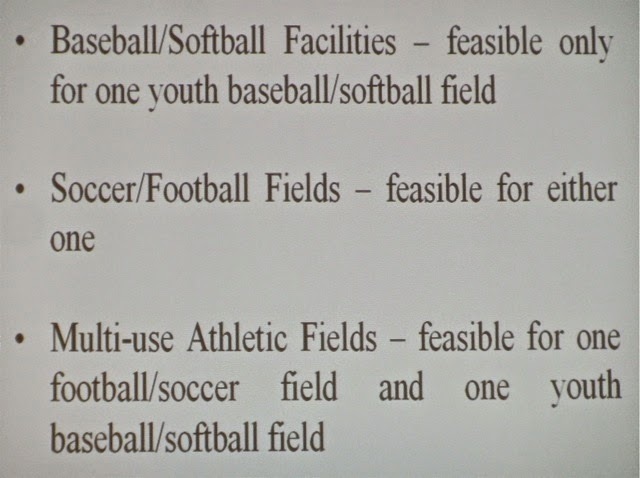 Well, if 10% of the effort expended with this committee had been spent working with the school district to hammer out an agreement about field use and lights thereon, we wouldn't be having this conversation. In my view, THAT is where our municipal energies should be aimed right now. And, I agree with Terry Cummings - the City should be making EVERY effort to line up our ducks toward acquiring the Fairview Developmental Center property when it becomes available - and NOT to just have it become more congested, rabbit-warren type housing that we're seeing sprout up all over town like mushrooms. 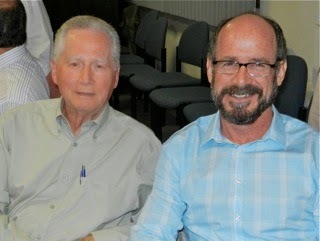 So, farewell to the men and woman of the Fairview Park Citizens Advisory Committee. All of you - current and past members - worked long and hard and actually DID accomplish a lot over the past 20 months. And a HUGE thank you to Ernesto Munoz, Bart Mejia, Yolanda Summerhill, Fariba Fazeli and the rest of the City staff for the thousands of hours spent on this effort. Good job! 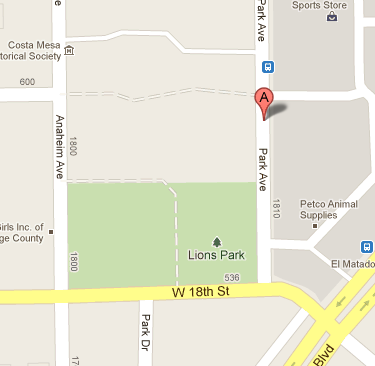 In what might be the last meeting, at least for a very long time, the Costa Mesa Fairview Park Citizens Advisory Committee meets tomorrow evening, 6-8 p.m., in the Victoria Room of the Neighborhood Community Center, 1845 Park Avenue (Lions Park). You can read the modified agenda HERE. We've seen several changes on the committee. 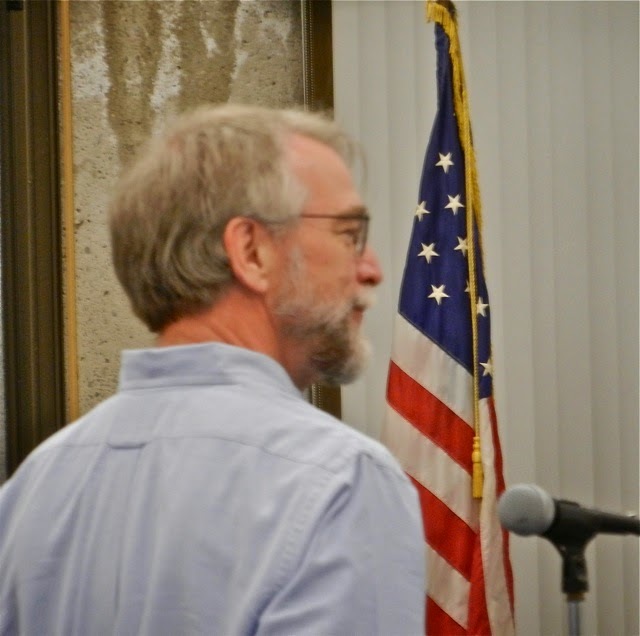 Member Brett Eckles resigned after he was recently appointed to the Parks and Recreation Commission. 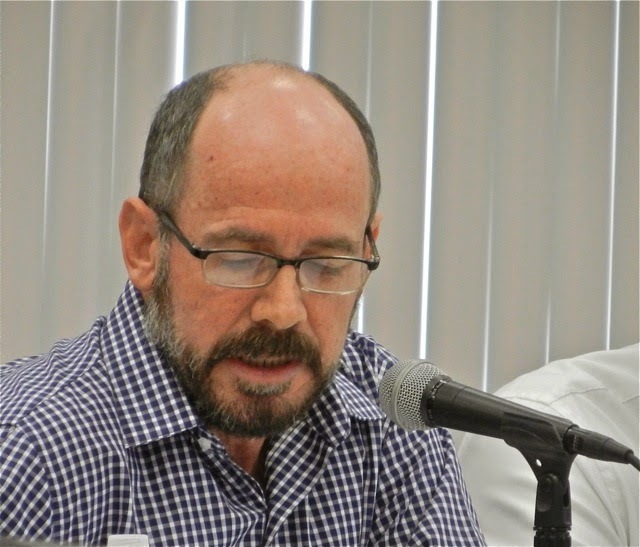 Since long-time chairman Dr. Richard Mehren abruptly resigned early this year at the end of the last meeting, Vice Chair Steve Smith will apparently run the show - at least until they get through the part of the agenda where a new Chairman is selected. That should be interesting. This image is of Mehren and Smith early-on in happier times. You can read the original work plan, with timeline, HERE. After more than 20 months of hard, sometimes contentious, work the committee will not be permitted to complete their mission. They've plowed through most of the original 35 items on their list, shown below. Only the most controversial items - playing fields - remain. 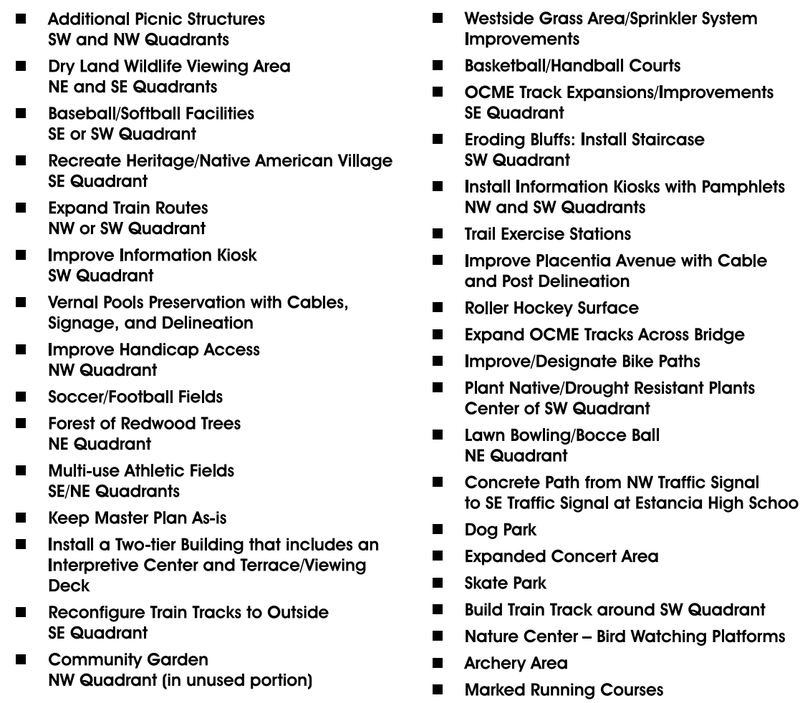 Now that the City has decided to hire a consultant to update the Master Plan of Parks and Open Spaces, the work done by this committee appropriately should be folded into that update as part of the Fairview Park Master Plan. I'm not quite sure what kind of a turnout to anticipate Wednesday. I hope another crowd shows up to hear the staff presentations and express their views. I cannot close this without observing that this meeting falls on April 1st.... it just seems SO appropriate. See you tomorrow.